The prime minister was out of the country giving a talk at the UN. The military rolled in at night, seized Bangkok and attempted to lock down the TV stations. The PM called in to some stations in an attempt to tell the population that the coup would fail, he was still in charge, etc. The military, unable to capture all the possible means of communication, simply cut off power to the city. A night in Bangkok without AC (or knowing what is going on) is not much fun, let me tell you. In 2014, the Thai military gathered the political leaders together for several days of talks, and then detained them en masse. The army was already on the streets, but they also took over all the TV stations, briefly shut down Facebook, and began detaining people for week long “attitude adjustments.” The Bangkok population was mostly eager for the coup to finally happen, because it ended the political turmoil (“mobs”), and brought the implied promise of a quick transition to civilian government not controlled by the PM ousted in 2006 (see above.) Again, the coup itself was very smooth, there wasn’t much organised resistance and the opposition leadership was neutralized while the population accepted the new leaders. Mobile Messengers, What Can’t They Do? 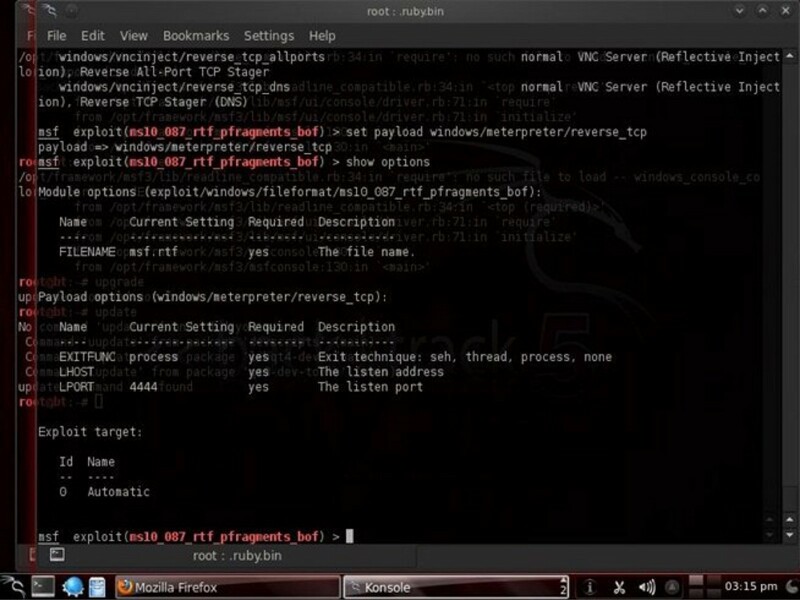 The coup in Turkey was organized and coordinated using an end to end encrypted messenger (WhatsApp), and the call to defence was sent out via an end to end encrypted messenger (FaceTime). The future is amazing. The putsch takes over the main TV station (TRT) has the news reader read a statement announcing the coup is “to reinstall the constitutional order, democracy, human rights and freedoms, to ensure that the rule of law once again reigns in the country, for law and order to be reinstated.” They also order the people to stay indoors. But, this is the era of cyberpower. Simply taking over the TV stations is not enough. The Internet is a more powerful means of communication than TV, and it is more resilient — especially with a sophisticated population. The Turks are experienced at handling attempts to cut their access to social media, and the putsch never even took over the ISPs. Erdogan left his holiday hotel and boarded a jet. This kept him out of the clutches of the putsch, and therefore free to organize and coordinate a defense. However, without access to the TV stations (he was on a plane, after all) he turned to cyberpower as a means to deliver his message and organise a resistance. Erdogan’s call to the people to take to the streets and protect democracy and their country was successful. 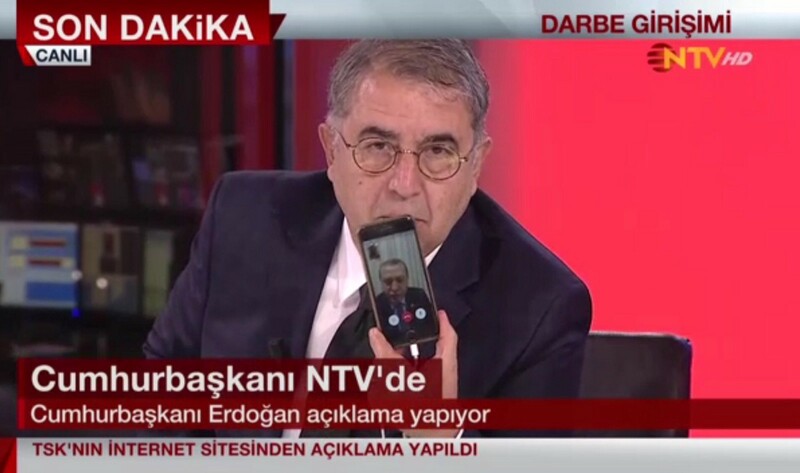 He was able to rally support using FaceTime (video calling) to TV stations, all from his jet above Turkey. His calls where shown live on at least two channels, and later the mosques took up the call and were used to help organize resistance. 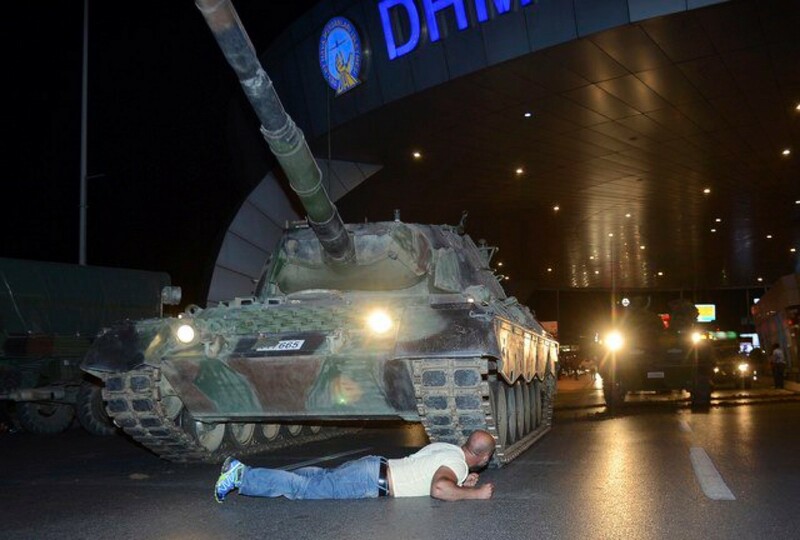 Update: the coup did attempt to throttle the Internet, but Erdogan ordered the throttling removed. This happened even before the mosques took up the call to the squares. Today, the TV and radio are not the only means available to get information to people. The Turkish putsch took over some TV stations and did the standard coup style announcement: “we’re doing this for you, blah blah blah.” But they failed to eliminate the Internet, and any blocking that they were able to do was ineffective. In no small part because the Turkish people have spent years learning how to circumvent the social media blockades that Erdogan has put in place at various times. This made the population resilient against attempts to mitigate the cyber weapons they deployed. The Turkish people turned out in droves, watching what was happening over Twitter and Facebook and then flooding the streets to stop the tanks. Videos of Turks fighting the putsch were circulating online less than an hour after the FaceTime call. The putsch’s “sucker punch” had failed — they failed to neutralize the leadership (Erdogan was alive and free), and they failed to undermine his ability establish a counter narrative and organise a resistance. A coup succeeds when people believe it has succeeded. The video call from Erdogan calling for active resistance and the videos of people successfully resisting the tanks were the beginning of the end.